Hjem » Sol & Solarium » Solariumskrem flasker » Bestie™ Ultra Dark Tan Maximizer 300 ml. Introducing your new tanning best friend! 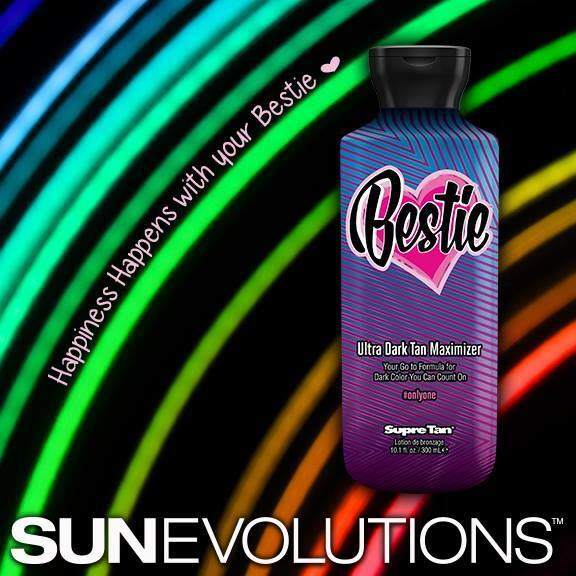 Bestie™ Ultra Dark Tan Maximizer is your perfect tanning sidekick for rich dark color you can count on. This dark tanning companion prepares your skin for long lasting color while an Antioxidant enriched BFF Skincare blend leaves your skin feeling hydrated and smooth to the touch. Never looked better, best friends forever! Dark natural tan enhancers work together to prepare your skin for maximum results. BFF Skin blend of Antioxidant enriched Berries, Fig and Flax Seed Oil helps nourish and hydrate skin leaving it feeling soft and smooth. Bestie from Sun Evolutions on Vimeo.